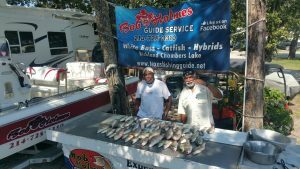 Good old customer Ricky Thomas and cousin Herchell have a blast this morning catching a unbelievable amount of hybrids and sandbass! I thank the fish wore us out! Thanks guys I will see you again in the Fall season! This entry was posted in Photos on July 17, 2017 by admin.